Connecting to the Essential Question: What are you going to be learning today? Students will be able to recognize that waves have a specific wavelength and frequency and that scientists and engineers use this knowledge to develop technologies that meet our societal needs and wants. Students review characteristic properties of model using a fun vocabulary strategy and create a graphic representation of electromagnetic waves and their uses. CCSS.7.RP.A.2 Recognize and represent proportional relationships between quantities. Specifically, this lesson ties to the Disciplinary Core Ideas PS4.A that states that waves have a specific wavelength and frequency and PS4.B that states that because light can travel through space it cannot be a matter wave, like sound or water waves. In addition, this activity helps students tie to the NGSS Essential Question, “What are characteristic properties of waves and how can they be used?”. In particular, this lesson helps students identify ways that waves can be used. Over the course of the lesson, students obtain and communicate information about light waves (SP8), develop models of wave properties (SP2), and use mathematics and conceptual thinking when graphing waves (SP5 and MP4). The unifying idea throughout the study of waves is Patterns, a Crosscutting Concept. Specifically, that students are using the patterns to identify cause and effect relationships. And that is how this lesson also addresses the Nature of Science - specifically that "Scientific Knowledge Assumes an Order and Consistency in Natural Systems". In the previous lessons, the students completed a series of lab stations that asked them to connect to the idea that different types of waves have similar properties but have differences in the way in which they interact with matter. 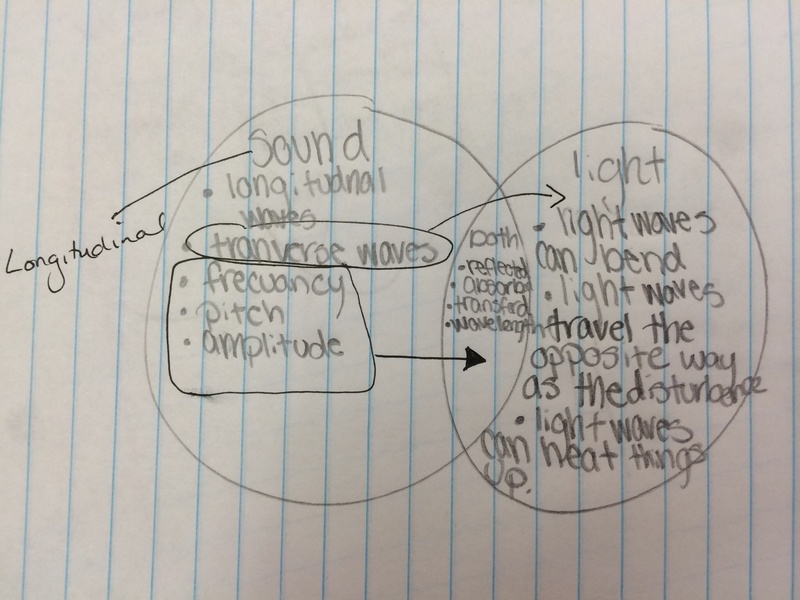 As a warm up, I ask the students to create a Venn Diagram comparing sound waves and light waves. I tell the students that this warm up is formative; it is a way for them to show me where they are in their learning. Thus, there is not a “set” number of things to include and students are not penalized if they do not have all the answers. I take these formative assessments and organize them into piles of students with similar needs or misconceptions. In the following day’s lesson, I will pull students by group to provide support and reteaching geared towards each group of student’s particular needs. One common misconception/omission is that sound and light waves have very similar properties. The idea that all types of waves have similar properties is a disciplinary core idea in the NGSS. 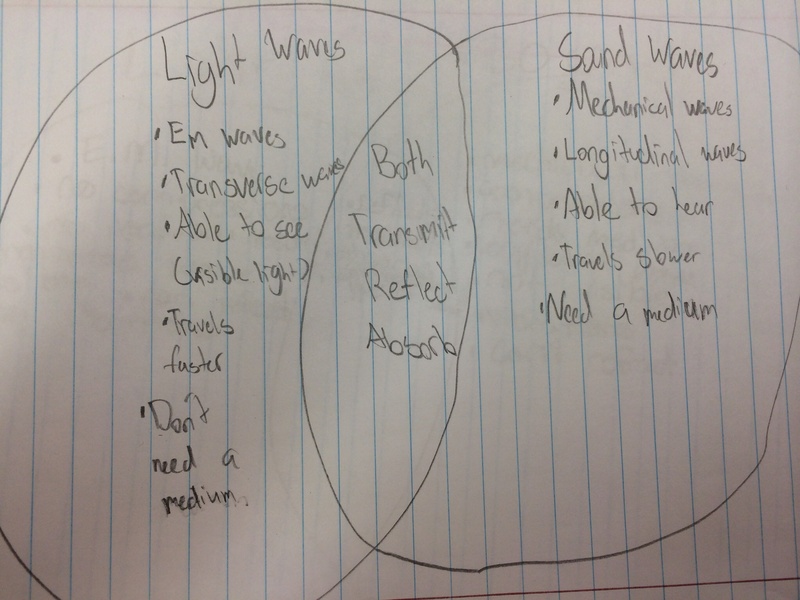 As you can see from the student examples above, even students who are making great observations are omitting the idea that waves have similar properties or have the misconception that only one type of wave has frequency, wavelength, etc. After each group is finished, they have to present to the class their drawing and explain how the picture shows the meaning. 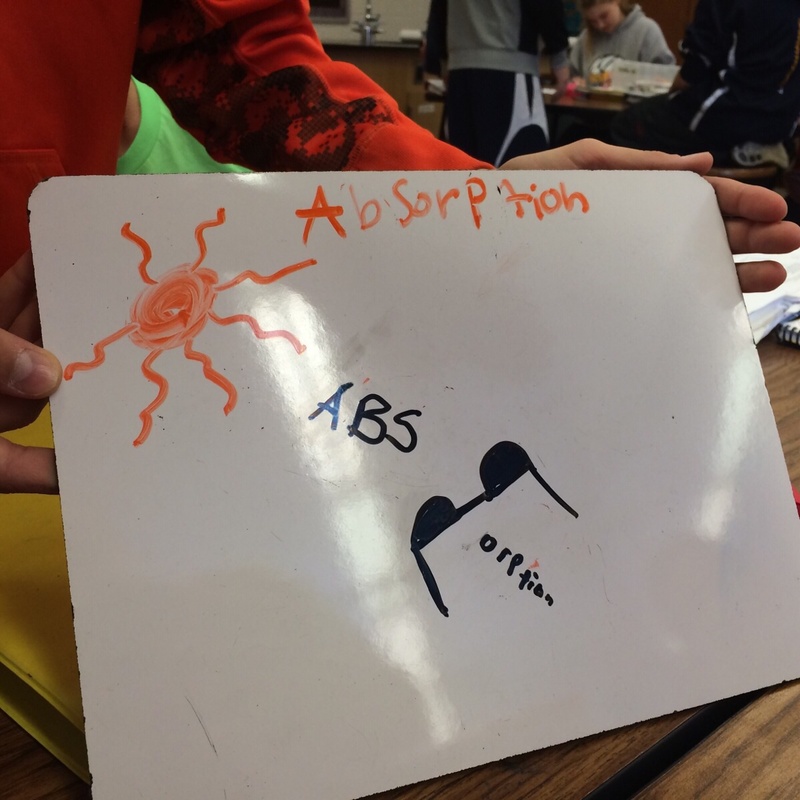 For example, the group describing the "absorption" picture explained that they wrote the "ABS" larger on the sun side of the glasses and the "orption" smaller on the other side because some of the rays were absorbed by the glasses. Every wave has a specific wavelength and frequency. Because light can travel through space, it cannot be a matter wave (mechanical) like sound or water waves. There is an inverse relationship between frequency and wavelength. Waves are used in the world to meet our societal needs and wants. Ask students to offer suggestions as to specific vocabulary or concepts they are going to be looking for during the day’s activity. Students may offer suggestions such as, “relationships between wavelength and frequency”, “examples of light traveling through space”, “examples of waves that have a specific wavelength and frequency”, or “ways that waves are used in the world”. Teacher: Today we will be taking a look at the Electromagnetic (EM) Spectrum. Earlier in the year, we discussed radiant energy What does radiant energy makes you think of? Teacher: Absolutely! Light is a form of electromagnetic radiation. There are actually different kinds of light and radiation. Today, you created a Venn Diagram comparing light and sound waves. What was a characteristic you might have listed that was unique to light waves? Student 1: Light is a transverse wave. Student 2: Light does not need a medium. Teacher: Oh! I just made a connection to what I am supposed to be learning today. Anyone else make that connection? Student: Number 2 in the focus areas says that because light can travel through space, it cannot be a matter wave. Teacher: Yes! Light waves in the EM spectrum do not require a medium. They do not need matter to transmit energy. Were there anything you found to be characteristic of both sound and light? 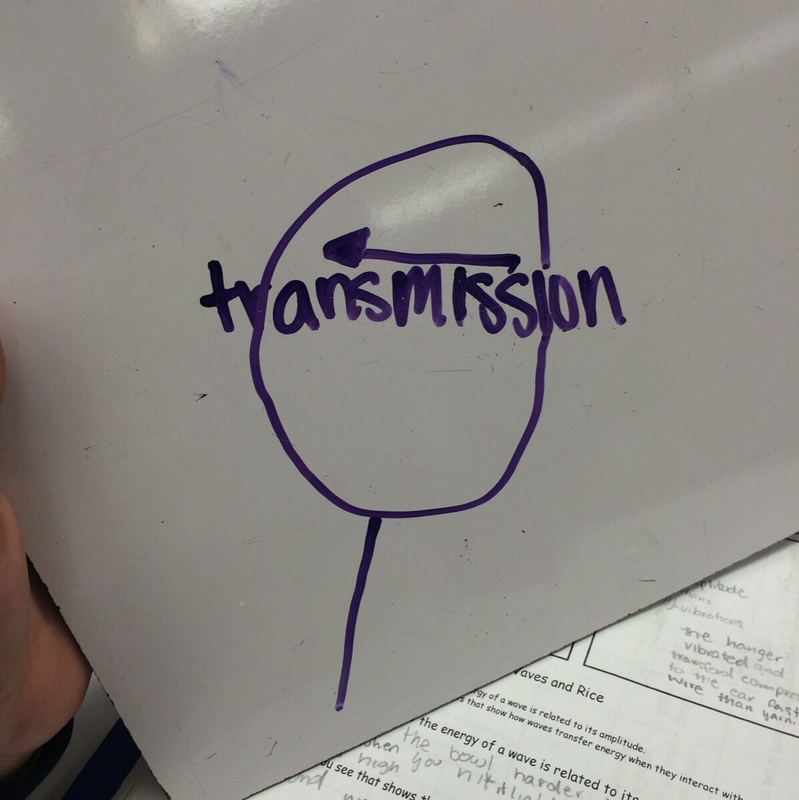 Student: They have similar properties like frequency, wavelength, and amplitude. They also can reflect, absorb, and transmit. They both transfer energy. Teacher: Oh, I see. All waves have similar properties like frequency and wavelength. Student: Ooooh! Frequency and wavelength are two of the things we were supposed to focus on today. * I spend a lot of time modeling and having students practice making connections to the skills and essential question prior to this lesson. Teacher: Yes! One very important understanding is that waves have a specific wavelength and frequency. This is true for electromagnetic waves as well. EM waves such as radio waves, microwaves, infrared light, visible light, ultraviolet light, x rays and gamma rays all have a specific wavelength and frequency. And, depending on our knowledge of each of these waves, scientists and engineers have developed technologies that use them to meet our needs and wants. 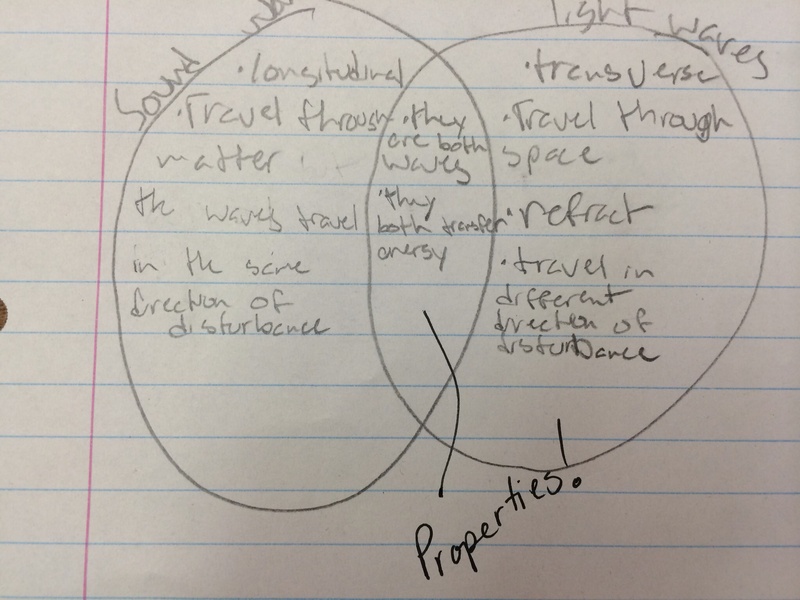 Student: I made a connection to the 4th focus area! EM waves can be used to meet our societal needs and wants. Teacher: I have provided you with a document called “The Electromagnetic Spectrum” that describes your task. Essentially, your task is to create a graphic representation of the EM Spectrum that demonstrates these ideas. This should be a “graphic” representation which means it should be more words than pictures. All of the 4 core ideas above should be shown in your graphic representation. The document provides you with some links to use for gathering the information you will need to complete this. You will have the rest of the class today as well as time tomorrow to complete it. To close, ask each student to share one example of how EM waves are used in the real world with their table. 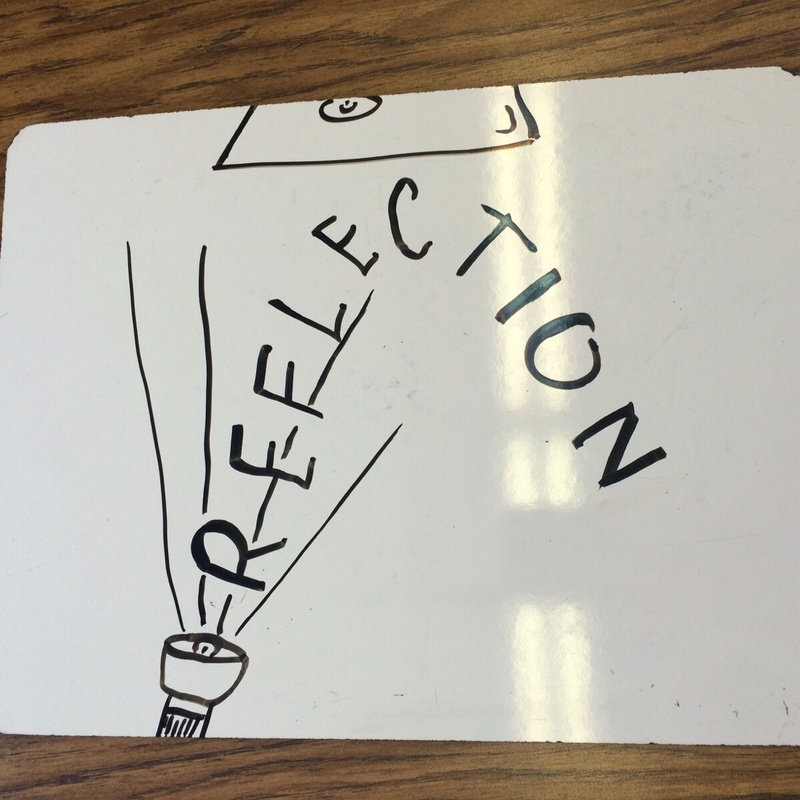 As students work, check in with students and ask them how their representation demonstrates each of the focus areas. 1. Every wave has a specific wavelength and frequency. 2. Because light can travel through space, it cannot be a matter wave (mechanical) like sound or water waves. 3. There is an inverse relationship between frequency and wavelength. 4. Waves are used in the world to meet our societal needs and wants. 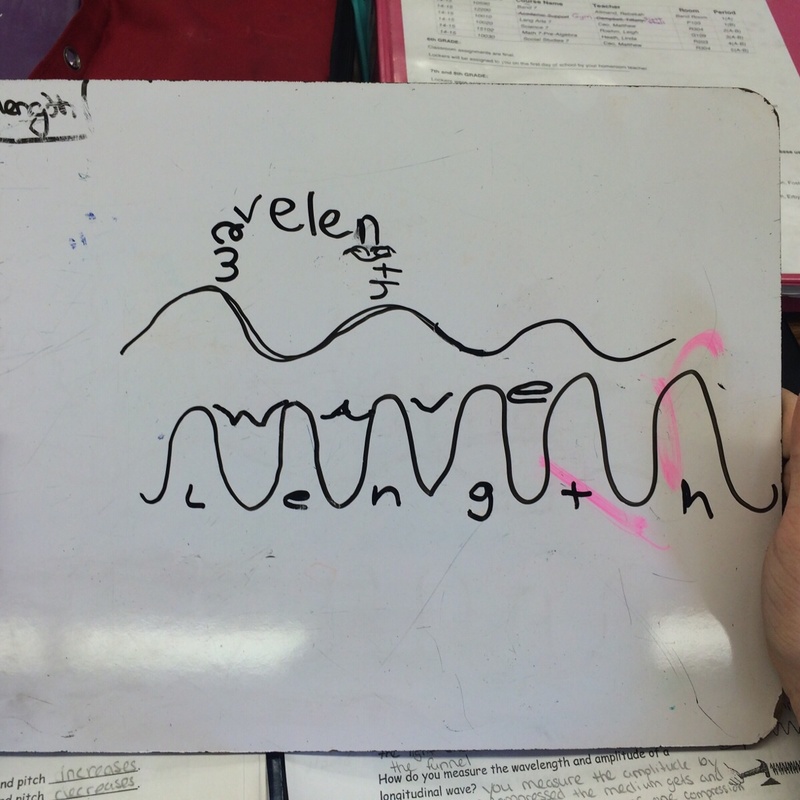 The student below has drawn a wave and labeled the waves in the EM spectrum in order of wavelength and frequency. She has titled the representation, "Each wave has a specific wavelength and frequency." 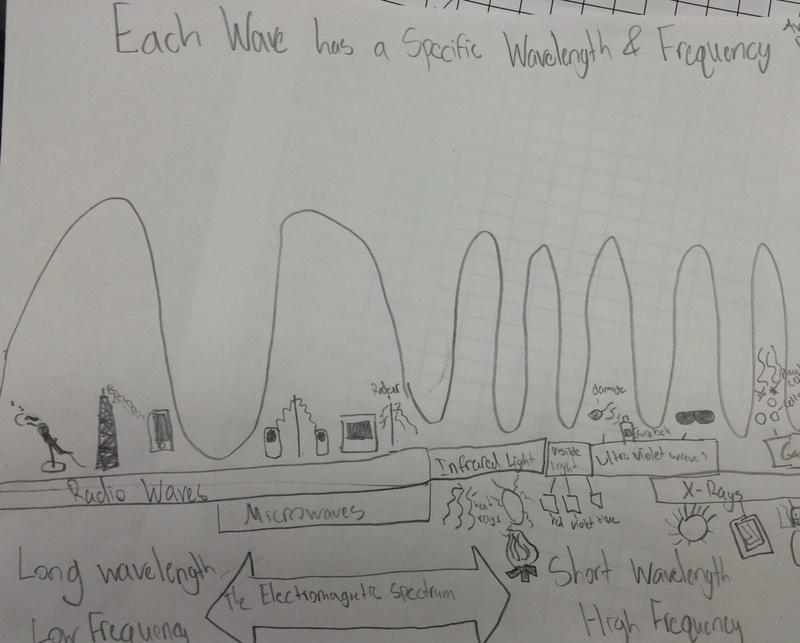 She draws pictures of uses of each type of wave and has included along the bottom a representation that shows the relationship between frequency and wavelength. One important note: I emphasize to the students that they do not have to memorize the electromagnetic spectrum. The purpose is to connect to the focus areas listed on the student sheet. I just want students to gain an understanding that each wave has a specific wavelength and frequency, that wavelength and frequency are inversely proportional, and that waves are used to develop technologies in the real world. Students now add anything to their light bulb that connected to the focus areas from yesterday or today (I again project these or write them on the board.). Ask students to share anything that they added to their graphic organizer and encourage students to add any new information that they hear other students share to their own light bulbs.